Cauliflower and broccoli are the same species and have very similar structures. This variety keeps well for a long time, extremely hardy and tasty. 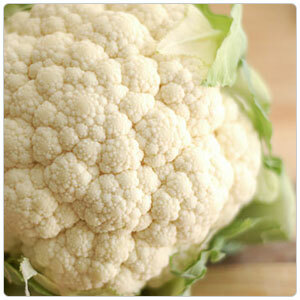 Cauliflower can be roasted, boiled, fried, steamed or eaten raw. It is great in gratins, soups and purees. When cooking, the outer leaves and thick stalks are removed, leaving only the florets. The leaves are also edible, but are most often discarded. The florets should be broken into similar-sized pieces so they are cooked evenly. After eight minutes of steaming, or five minutes of boiling, the florets should be soft, but not mushy (depending on size). The first reliable reference to cauliflower is found in the writings of Arab Muslim scientists, which date from the 12th and 13th centuries.